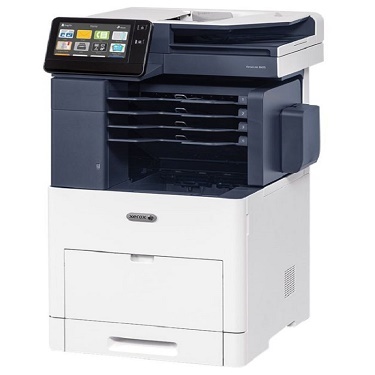 The Xerox VersaLink B605/SPM B/W Multifunction Printer is a heavy-duty monochrome printer capable of handling all your everyday tasks such as printing, copying, and scanning. The warm up time of the Xerox VersaLink B605/SPM is a mere 47 secs. Also, the first printout comes out in a matter of 7.5 secs. The maximum printing speed of the B605 B/W Multifunction Printer stands at 58 pages/minute. The printer comes loaded with features such as automatic duplexing and a maximum sheet capacity of 3250 sheets ensures you get a printing powerhouse that is tough enough to withstand the challenges of everyday use. The supported media types of the Xerox VersaLink B605/SPM include envelopes, plain paper, labels, card stock, etc. Bring home the Xerox VersaLink B605/SPM B/W Multifunction Printer to get more productivity out of your everyday printing jobs.